Blog – Page 2 – Elizabeth Anne Wood, Ph.D. Yesterday I was on the phone with a friend who was feeling paralyzed about a project he’s working on. It was one of those things that happens to me sometimes. I have a task to do that I don’t want to do. I make it much bigger in my head than it really is. I avoid it, and then I feel guilty about avoiding it. Then I can’t get anything else done because I know I should be working on the original task. In my friend’s case, it was a matter of writing a proposal for a job, and there were good reasons why the proposal was daunting: the job involved a some variables that would be hard to control, and the working relationships of the people involved were strained. Every time he sat down to work on it, he said, he’d get paralyzed and end up on Facebook. He also said that he knew he could explain the project to someone else, but he was just having trouble writing it down. He hates paperwork, and doesn’t work well alone, he said. My friend was so self-aware that he understood all the parts of the problem he was having. He just didn’t see the solution: Ask someone to help. I offered to spend an hour on the phone so he could talk out the project and get it out of his head and onto paper. Today he’s going to get that proposal done! Asking for help can be hard for a lot of reasons. Sometimes we think we shouldn’t need the help or that we don’t deserve it. Other times we think that the help we need is too much to ask someone to give. Sometimes we forget that there are people we can actually ask. This is especially true for those of us who work alone. Who can you ask for help when you need it? It’s easier to ask for help when you know who you can count on. Which friends or coworkers or family members are good at the kinds of things you might need help with? Who do you trust? Another thing that can make it easier is to be able to offer something in return. When we pay for help we don’t think twice about reciprocity. The cash exchange makes it unnecessary. Social relationships, though, are built on reciprocity. Helping one another strengthens relationships, and the strongest of those relationships are generally the ones where the help flows in both directions. Know who you can reach out to. Know what you can offer to others. And most of all, know that you deserve the help you need and that you are not alone in needing it. So the bishop and his congregation took it upon themselves to march through the city in an attempt to get the saints to help them. While they marched through the city they sang hymns and carried torches in their attempt to invoke help against the potential attack. It is what the “Organize!” fish poster illustrates, and it is the logic of unions and social movements. When you look at the goals you are trying to achieve, look around you and try to identify allies that you might have overlooked, and ask whether the goal you are trying to achieve might be of importance to others. Even purely personal goals can be easier to achieve when we have the support and commitment of allies. I would not have been able to finish My Mother’s Cross without a team of people who believed I could do it and offered support and encouragement along the way. Mom in the hospital a few months before she died. 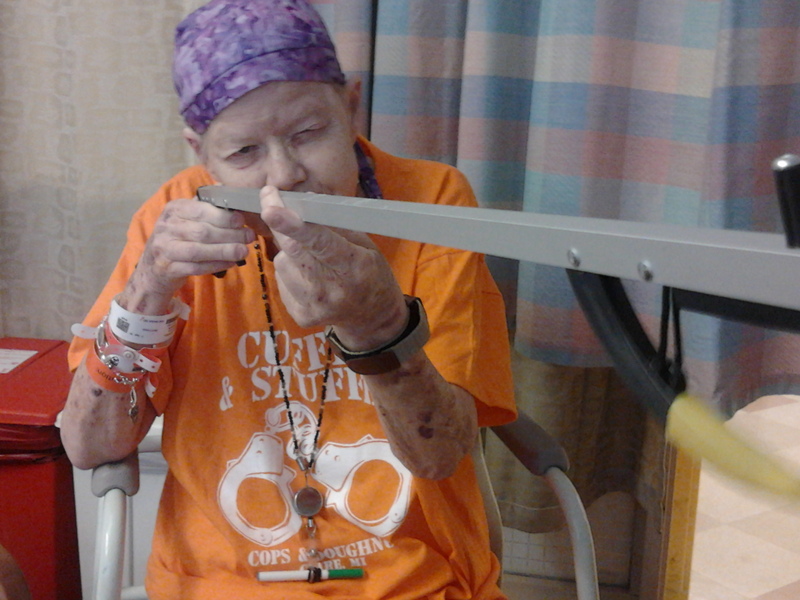 She is wearing her favorite orange “Cuffed and Stuffed” t-shirt and using her grabber as if it is a rifle. Yesterday Sophie Gilbert published an essay at TheAtlantic.com celebrating the 18th anniversary of the first episode of Buffy the Vampire Slayer. She describes the ways in which Buffy represented a conventional teen hero (pretty, blond, athletic), and then all the many ways in which Buffy the character and Buffy the television show were subversive in the sheer joy they took in displays of female power. 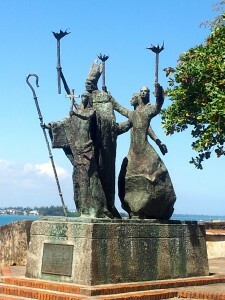 This statue, called Gatogirafo, stands outside the Museo del Niño (Children’s Museum) in the old city of San Juan, Puerto Rico. It was right across the street from our inn, and I was captivated by it immediately. 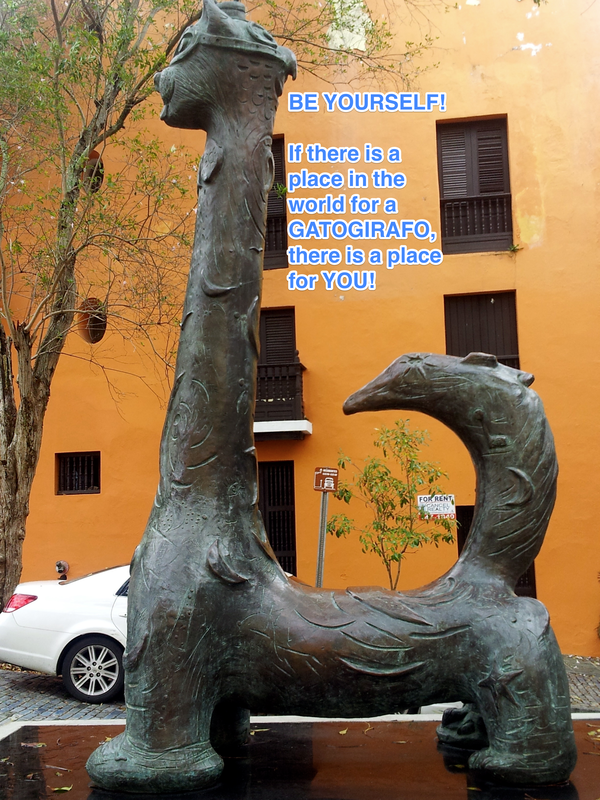 The Gatogirafo sends a great message to children. It’s okay to be strange, different, intriguing, hard to categorize. It’s a whimsical statue standing in an ancient city reminding us that we are each made of a whole bunch of interesting pieces. The Gatogirafo has a clear place in the world. So do you. But thankfully you are not a statue! You have the power to find places where you best fit in, and you have the creativity to decide how to present yourself in the place you are right now. I love pigeons. Pigeons are everywhere in NYC, and it’s easy to disregard them as a moving greyish mass of messiness. But when you take a moment to really look at them, they are quite beautiful, each with a unique pattern, and they fulfill a variety of niches in the city’s ecosystem. The pigeon in this photo was nesting in a niche in the wall of El Moro, in San Juan, Puerto Rico. I took the picture for a friend of mine who says if she is ever reincarnated she wants to come back as a pigeon. As I look at the photo now, back in NYC, I think about it as illustrating the creativity we need to find our own niches. 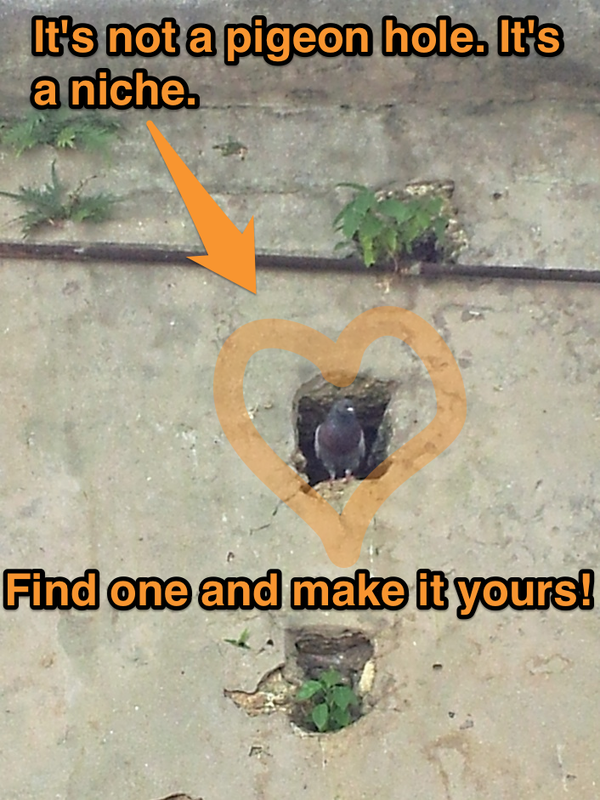 The hole in this enormous city wall was not made for this pigeon. But this creative little creature has adopted it and made it her own. We need to find our niches where we can, and we need sometimes to look in unlikely places.